I had an opportunity to visit with Alfonso. I was so impressed with him. He also took care of things when I realized that the comforter had down and I am allergic to down. He found me blankets right away. He definitely is doing a good job and has super potential. The price was right on a clean and comfortable place.I liked the location. However, there are no extra amenities. The two ladies I spoke with on the phone were great and the website is very easy to use! Your Insta account also lead me to find the shop, The Big Lake...it, along with its owner was fabulous!!! This was a great rental for our family. We travelled as a family of 5 with teenagers and a grandma! The three bedrooms were wonderful, so everyone could have their own space. The kitchen was well equipped and plenty of seating in the living room area. The dining room table was also very large and we enjoyed evening card and board games. The location was perfect. While we have visited the north shore for many, many years we have never stayed in Lutsen. The Log Lodges were very private, yet very convenient to the mountain activities, Grand Marais and Tofte. Everything was set up via email, and communication was clear and timely. It was a good experience. The location is as great for us. The view of Superior out the window was amazing. Saturday night was difficult as people were using the grills just outside our balcony while chain smoking, so we were forced to close windows. I contacted Cascade by phone to assist with payment. Try answered the phone and helped with my issue. This was a fabulous home. Room for all. Close to the water and close to hiking and mountain biking. It was clean and had everything we needed. The gentleman carrying out some of the drywall/painting repairs was an excellent ambassador for the property. Very insightful on the history of the area as well as emmenaties relating to summer and winter activities. We'll definitely be back...even with the 8-hour trip from Winnipeg! Aside from a "hick-up" of little or no water pressure on the Saturday of our 3-day stay, this was a great place to stay. Price was perhaps a little steep compared to some of the other local venues, but we'd still consider coming back to the Mountain Inn. Perhaps some Canadian pricing incentives would be considered by the Cascade group - Canadian $$$ at par, etc - this would ensure an increased capacity for the venue. We had a great time. Accommodations were great. It is just as lovely as reviews have described it. Everyone was warm and helpful! Lovely place with loads of natural beauty and peace. The only time I had much interaction was when booking our stay. The person I chatted with online was very helpful in finding some different cabin options for us to choose from. Very friendly and helpful! This was such a cute little cabin! I so enjoyed getting up every morning and having a cup of hot tea on the deck and looking out on the lake. The cabin had a nice little kitchen, perfect for making breakfast in the cabin before starting our day of hiking. Thank you to the owners for sharing their space with us! The house was great! SUPER comfortable. We have stayed at numerous VRBO's and Cascade rentals... this tops our list for most comfortable so far. Very quiet. Comfortable furniture, Good bed to sleep in. Wonderful deck. One downside: lack of air flow. But the owner provides plenty of fans. We really enjoyed staying here. The view was beautiful! The space was very nice and cozy and had everything we needed. There was plenty of space for all 5 of us. The location was also very ideal as we could get to all of our favorite hiking trails within a 5-10 mn drive and Grand Marais in about 20mn. Very easy to rent a property- always prompt with sending e-mails. We have been staying at #211 for the last several years. We always look forward to spending our family vacation at Devil Track Lake and my family always has a wonderful time there. 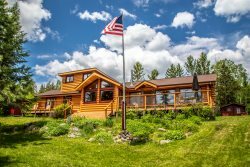 Great location - secluded by close to Grand Marais. The location is perfect. Between Tettegouche and Temperance and Grand Marais. All within driving distance. The house was so nice, comfortable, stocked with everything, and the view was beautiful. Nice quiet location. Sauna was a bonus! Great to have wifi. Process was easy to book and check-in was seamless! Overall, Anchor Point was WONDERFUL. The house was clean and gorgeous! It's right on the water - just what we were looking for. The game room was an added bonus for our group - we spent every night hanging out there. We came with a smaller group, but this home can comfortably sleep 14 people! Definitely recommend!! We had a nice relationship with the person who set up our reservation. I still don't understand the $40 fee, but she was helpful and very nice. We have not used Cascade for any other vacations, yet. I can always be guaranteed a well maintained and clean rental when booking with Cascade. The unit was clean and easy to find. I didn't notice it did not have AC until we arrived and it was humid but fortunately not overly warm outside. Also, the chairs on the deck were very uncomfortable. Since the weather was nice, we wanted to sit out on the deck so we bought portable folding chairs. Also, the pull out sofa mattress was very uncomfortable so one person slept on the couch instead since the futon was in an alcove that was warm and noisy from the road. The unit would be fine in the fall, spring and winter. I would not return in the summer again.